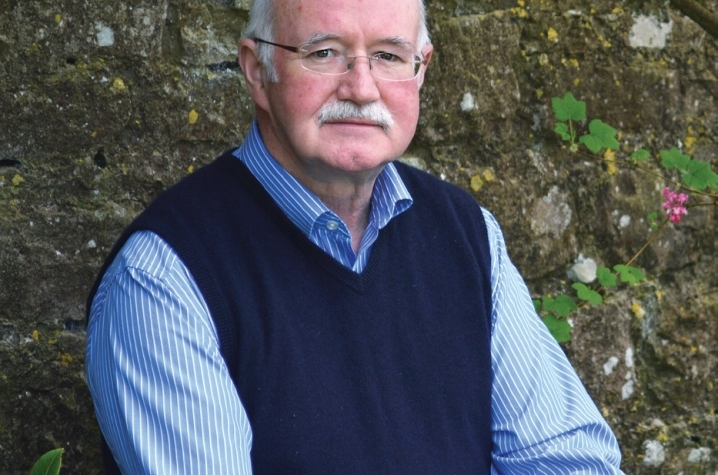 LEXINGTON, Ky. (April 8, 2016) — Peter Fallon, poet and founder and director of Gallery Press, Ireland's preeminent publisher of poetry and drama, will explore the tradition of Irish literary publishing as part of the 2016 International Hammer Book Arts Biennale Lecture presented April 12. 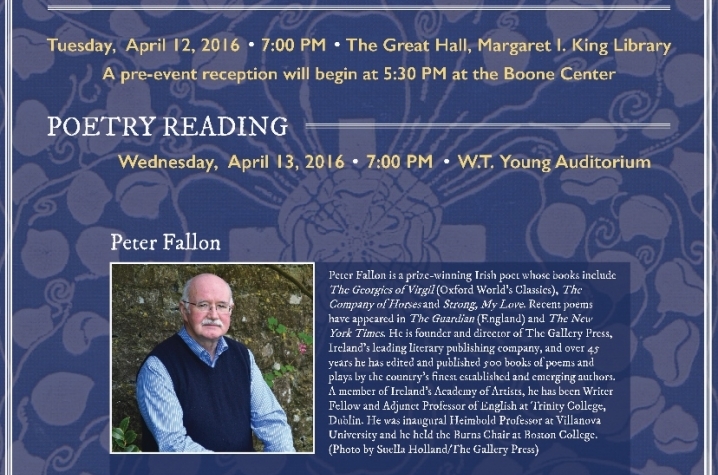 As part of his visit Fallon will also deliver a poetry reading on campus April 13. Both events are free and open to the public. Fallon's Hammer Biennale Lecture, “The Purpose of Praise: Extending the Tradition of Irish Literary Publishing,” is the seventh in the history of the lectureship. The lecture will begin 7 p.m. Tuesday, April 12, in the Great Hall, on the second floor of the Margaret I. King Library. Prior to the lecture a pre-event reception will take place at 5:30 p.m., at the Hilary J. Boone Center. The following day, Fallon will give a poetry reading 7 p.m. Wednesday, April 13, in the UK Athletics Auditorium of William T. Young Library, with a reception following in the Alumni Gallery. Described as “one of Ireland’s greatest literary talents” by the Sunday Times of London, Fallon is a prize-winning Irish poet whose work includes a translation of Virgil's "Georgics" for Oxford World’s Classics, "The Company of Horses" and "Strong, My Love." Fallon’s recent poems have also appeared in The Guardian and The New York Times. Over 45 years, Fallon has edited and published 500 books of poems and plays by the Ireland’s finest established and emerging authors. A member of Ireland’s Academy of Artists, he has been writer fellow and adjunct professor of English at Trinity College, in Dublin. He was the inaugural Heimbold Professor at Villanova University and he held the Burns Chair at Boston College. The King Library Press Book Arts Lecture honors Victor and Carolyn Hammer, Lexingtonians who were prominent in the field of American private presses. Carolyn, former curator of rare books at University of Kentucky Libraries, was founder of the King Library Press. The Hammer International Book Arts Biennale was established to honor the Hammers and their legacy to fine printing. Every other year a distinguished internationally reputed lecturer presents a discussion on printing, typography, illustration, book-binding, graphic design or another feature of the book arts. A keepsake for each lecture is printed at the King Library Press and features one of Victor Hammer’s engravings, line-cuts or wood-cuts. This year's lecture and poetry reading by Fallon are also part of the "Year of Europe" programming and are co-sponsored by the UK College of Arts and Sciences, Department of English and UK Libraries. A complete listing of Year of Europe campus activities can be found at: https://europe.as.uky.edu.